HON. ERIC JOYCE, MP, CULTURE WARRIOR!!!!! | AMERICAPHILE RESURGENT!!! ← SAVE ALLEN WEST!!!! SAVE AMERICA!!!! HON. ERIC JOYCE, MP, CULTURE WARRIOR!!!!! THANK YOU ERIC JOYCE FOR LOVING FREEDOM AND FOR COURAGEOUSLY SAYING “NO!!!! !” TO LINGUISTIC APARTHEID, PRICE DESCRIMINATION, OPPRESSION OF WORKERS, CHILD ABUSE AND SABOTAGE OF GREAT BRITAIN’S PUBLIC TRANSPORTATION SYSTEM!!!!! Comments Off on HON. 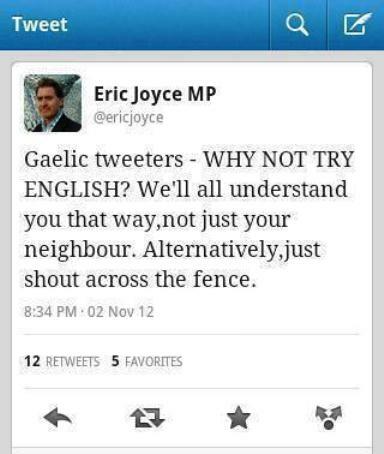 ERIC JOYCE, MP, CULTURE WARRIOR!!!! !